Recognising the need for flexibility and innovation, GFP promotes a variety of programming – based in sport, arts, advocacy, dialogue or empowerment – granting volunteers the opportunity to carry out peace-building programmes that suit their contexts. This piece focuses on the Dialogue For Peace Programme (DPP) currently commencing in Accra, Ghana where dialogue was chosen as a means to address the unique conflict within that context. Along with Georgia and the Republic of Macedonia, Ghana is one of three locations where DPPs are underway. In all three, a DPP was chosen as it was better suited to the context than GFP’s other vehicles for peace building. In Ghana specifically, the socially diverse national capital of Accra is the scene where the DPP is currently ongoing, focusing on engaging members of the country’s two main political youth clubs at the University of Ghana in dialogue sessions. The local Pioneers and Delegates decided to focus on the youth clubs of the two main political parties in Ghana: the socialist National Democratic Congress (NDC) and the conservative New Patriotic Party (NPP). Following the end of the single-party system in Ghana in 1992, the NDC has governed the country with the exception of the period 2000-2008, when the NPP was in power for two consecutive terms. Support for both parties are relatively evenly distributed around the country. With that being said, the NPP generally enjoys more support in the north, while the NDC has strongholds in the south and the east of the country. Moreover, religion also impacts slightly on party alignment. Christians, who make up around 71% of the population, mainly support the NDC while Muslims (18%) tend to support the NPP. In Accra specifically, being a melting pot of people from several parts of the country, support for the two parties are relatively even although the NDC has historically claimed victory in most local elections. Despite being surrounded by countries where politics often escalate into violence, Ghana has been relatively spared from this type of violence. However, there is a worrying trend of increasing political violence, especially around the time of national elections. For example, there is a gradual spread in the use of ‘macho men’, or armed thugs, to intimidate voters or otherwise affect electoral outcomes. In the most recent elections, there were several eye-witness accounts of ballot boxes being stolen or destroyed by such groups. These developments are indeed evidence of the increasing contestation between the NDC and NPP and the strategies through which they look to gather support. Every politician has their macho men now. You always see them around the time of elections. They are big, young, and very loyal to their masters. People are afraid of them and they cause trouble. What the NDC and NPP are in turn competing for is the support of the roughly 20 million citizens of Ghana. This is where Ghana’s youth comes into the picture. Out of these 20 million, 11.5, or 57% of the population, are under the age of 25. Ghana’s youth bulge is thus an important constituency for NDC and NPP to focus on for both the present and for the future. As a result, both parties are creating youth clubs in most cities and at all Ghanaian universities. Political youth clubs are important initiatives in communities that do not necessarily cause cleavages amongst a population. Instead, they can primarily be seen as opportunities for people to voice concerns and discuss issues. However according to local GFP volunteers, the political clubs at the University of Ghana have rapidly contributed to rifts. Students are increasingly divided along party lines, and these ideological differences are best manifested during official university events, at club rallies and in the display of propaganda materials. Having witnessed this rise in political violence, GFP volunteers believe that youth club affiliations and their resulting activities have prompted or strengthened existing political and socio-economic divides between students. Although an unintended consequence, these divides increase the likelihood of violence at the university, which is why the GFP volunteers decided to design a dialogue programme focusing on improving the relationships between the student members of political youth clubs. Dialogue allows for different perspectives to be shared, highlighting that it is possible for viewpoints to be conflicting and yet valid at the same time. 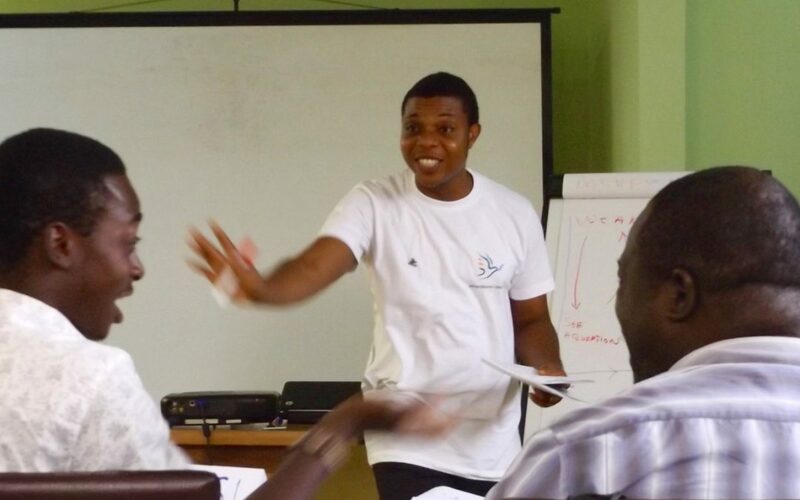 Dialogue deepens people’s understanding and respect of each other, which is why the GFP volunteers found it to be a particularly useful vehicle for addressing conflicts between political youth clubs. Moreover, as the dialogue sessions can be conducted in intra- and inter-group settings, the Pioneers and Delegates intend to facilitate interactions both among and between the members of each club. The youth clubs at the University are creating divides between students where these did not exist before. The discussions are no longer about ideas, but about association. We believe a Dialogue Programme can help with this. As such, the GFP Dialogue For Peace Programme is an important step in transforming and reducing the political violence between the members of the youth clubs of NDC and NPP at the University of Ghana. The local Pioneers and Delegates are confident that dialogue is the most suitable vehicle for peace building to build trust and foster tolerance between the two groups. With national elections coming up in November 2016, this will become even more important. Interview 1 with Accra Delegate, Accra, Ghana. 3 February 2016. Amankwaa, C. 2013. ”Election-Related Violence: The Case of Ghana”. Nordic Africa Institute – Uppsala University. Pp. 21-22. Sayibu, A. 22 November 2015. ”NDC, An Epitome of Political Violence in Ghana”. Modern Ghana. Available at https://www.modernghana.com/news/657363/ndc-an-epitome-of-political-violence-in-ghana.html. Accessed on 14 March 2016; Center for African Democratic Affairs. 30 June 2012. “Election Violence in Ghana”. Modern Ghana. Available at https://www.modernghana.com/news/403939/election-violence-in-ghana.html. Accessed on 13 March 2016. Interview 3 with Accra Delegate, Accra, Ghana. 3 February 2016. Interview 2 with Accra Delegate, Accra, Ghana. 4 February 2016.